Mathers started his career at amateur club Milford Marlins ARLFC, based in Leeds and signed with the Leeds Rhinos academy side at the age of 18. He was given a loan spell at Warrington Wolves, where he made seven appearances before returning to the Rhinos and breaking into the first team at the end of the 2002 season. Mathers made 88 appearances for the Rhinos, scoring 26 tries in that time including scoring against Canterbury Bulldogs in the World Club Challenge in 2005. Mathers suffered a serious knee injury during the summer of 2006 against Hull FC at Headingly, ending his season and Leeds Rhinos career. The following season he made the move to Australian Rugby League, signing for Gold Coast Titans. The fullback played six rounds for the Titans and looked on good form before rupturing the anterior cruciate ligament in his right knee. The injury kept Mathers out for the remainder of the season and on the 6th November 2007 it was announced that he had signed a 3 year contract with Wigan Warriors. Mathers made his Warriors debut in a friendly against Widnes Vikings which saw Wigan win 42-18 and Richie score two tries. He became the only player to be sent off twice during the 2008 season, first for a high tackle on Warrington’s Matt King in the fifth round then for leading with an elbow on Wakefield’s Jason Demetriou in round 25. Mathers then made a return to Warrington Wolves for the 2009 season, where he won two successive Challenge Cups, firstly against Huddersfield Giants in 2009 then against his old club Leeds in the Challenge Cup Final in 2010. The signing of 2009 Man of Steel Brett Hodgson caused speculation over Mathers’ future at the Wolves, as questions were asked over whether he would be first choice fullback for the following season. In July 2010 Mathers turned down a one year contract with Warrington in favour of signing on with Castleford Tigers in a three year deal. 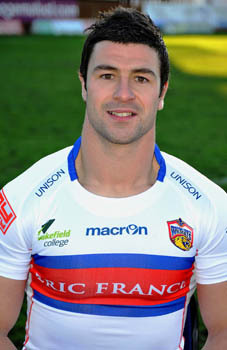 He made 22 appearences for the Tigers, scoring 7 tries, before it was announced that he would join local rivals Wakefield on a season long loan for the 2012 season.